Cheam Angling, est.1980, serving the south of England for more than 35 years. Established since 1980, Cheam Angling has grown to be the South of England’s premier fishing tackle superstore. 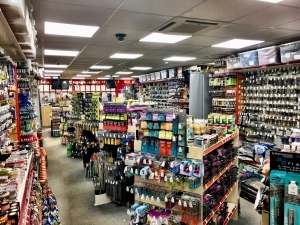 Based in North Cheam, Surrey and spanning over 2 air conditioned floors, Cheam Angling stocks a vast range of products from major manufacturers such as Korda, Trakker, Nash, Fox, Mainline, Drennan, Preston, etc, etc..the list goes on. Our staff consist of carp, match and pleasure anglers who are always on hand and happy to help with advice to suit beginner and seasoned anglers alike. We pride ourselves on our friendly customer service and satisfaction guarantee. All year round we stock Maggot, Caster, Pinkie, Worm and plenty of pike and sea baits.